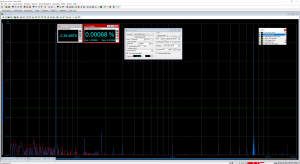 A number of requests for EL DAC benchmarks have popped up lately. 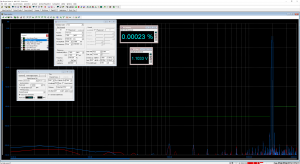 Below you’ll find our usual set of tests, conducted in each digital input mode. Our archived EL DAC screenshots from 2016 prototyping contain codenames and irrelevant content; the analyzer test PC has also changed over the past two years. Thus, the entire collection of benchmarks was repeated for this post to give some sense of screenshot consistency. Sampling rates, frequencies, amplitudes, and analyzer configuration data should be discernible for each measurement. Configuration details are essential to anyone who wishes to compare or replicate our measurements, so please feel free to reach out if any information is unclear. As a general reminder, different test setups will produce different results! 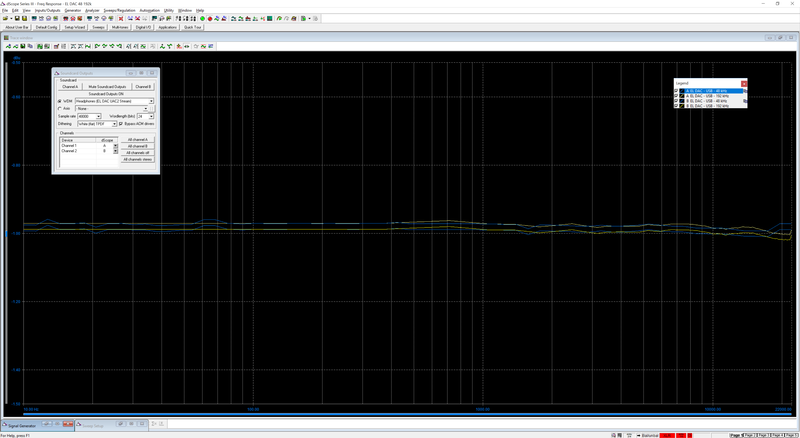 When using USB mode, set sampling rate to the highest integer multiple of your music collection. 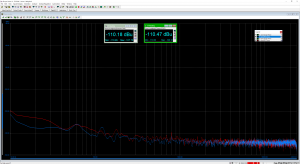 For example, use 24/176.4kHz for a collection of 44.1k or 88.2k or 176.4kHz files. 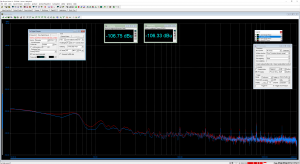 Use 24/192kHz for a collection of 48k or 96k or 192k audio files. Alternatively, you may use ASIO drivers. 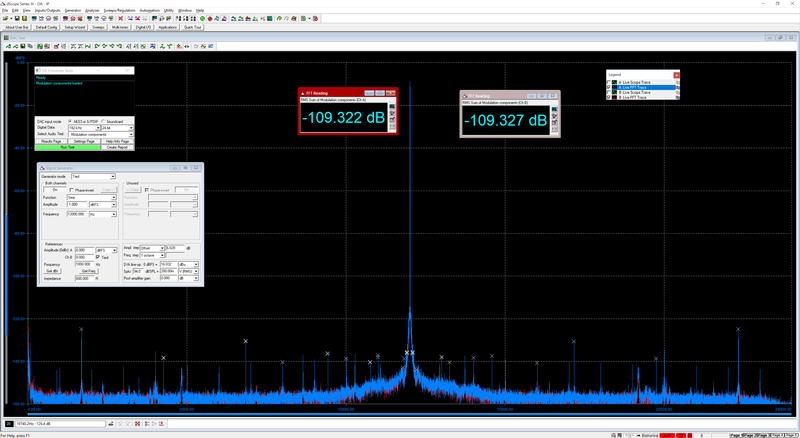 EL DAC automatically selects appropriate clocking rates for Optical and Coaxial S/PDIF modes. 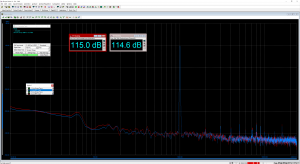 S/PDIF input is optimized for 44.1k, 48k, 172.6k, and 192k source sampling rates. The above suggestions are applicable to all PCM DACs and ensure maximum MCLK rates are provided to the DAC. 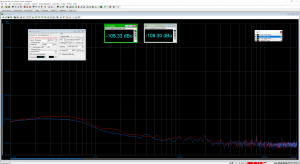 Deviating from these suggestions will limit MCLK rates, resulting in fewer interpolation samples to the AK4490, and a consequent decrease of 0.35dB frequency response in the highest audible octave. So, follow the instructions guide. More on this another day. In accordance with these recommendations, the USB Playback device in Windows was set to 24/192kHz for all 48k and 192k tests. Before diving into benchmarks, it’s important to note that we have used three different styles of optical jacks in EL DAC since 2016 due to worldwide inventory shortages (no circuitry, ICs, or passives have changed). While all three TOSLINK connectors tested successfully at 192kHz on the audio analyzer, two customers reported unsuccessful optical connections in early 2018, so we promptly exchanged as needed, and eliminated the troublesome optical jacks. OL DAC and EL DAC only ship with the preferred Everlight TOSLINK connector as of March 2018, and benchmarks below were conducted with the Everlight connector. The TOSLINK and isolated coaxial inputs rely on the same S/PDIF to I2S controller, thus, performance is similar in most scenarios. Optical and coax modes mode achieve slightly better THD than USB mode. Jitter is more ideal in USB mode, as expected from comparison to an S/PDIF signal. All results exceed our expectations for audible transparency. As always, discussion is encouraged! JDS Labs is swamped between several active projects and double digit order growth. 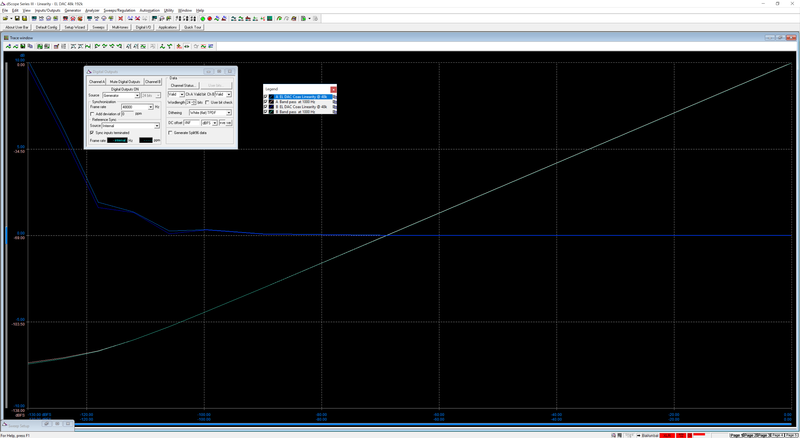 Time allowing, we’ll share a measurement perspective of interpolation filters. Oh, that’s nice to see. Charts are often a lot more informative than single-number stats. USB Linearity really cuts off fast at 118-ish DB, and TOSLINK seems to extend better than Coaxial. Most interesting thank you for this in-depth article, as an EL Dac owner this was a fun read. Most intriguing for me was the different frequency responses (slight differences in the roll-off). Just wondering, what is the reason behind setting the USB to the highest sampling rate? Wouldn’t it be better to set it to the music’s native sampling rate? @Cris, the reason is that WASAPI shared mode is used for the measurements (see my post below). In this mode, all audio streams for a device are converted to the format specified by the user (= bit depth / sampling rate combination). JDS Labs want to make sure that a test signal is not down-converted in bit depth and sampling rate. Therefore, they set both to the highest available combination. 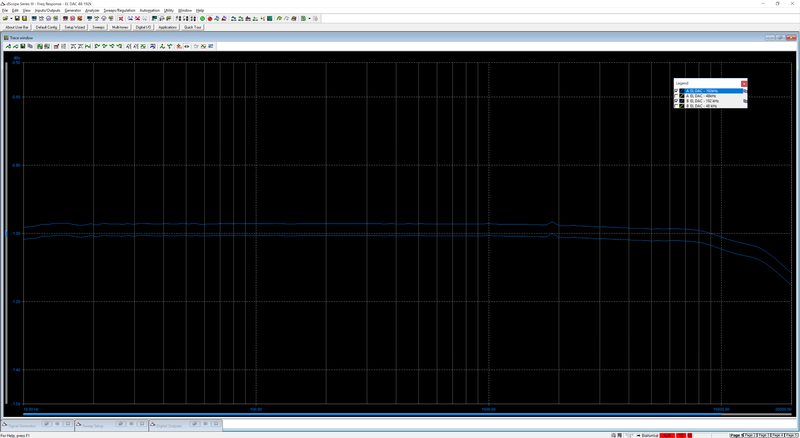 However, this is not a wise solution for a test signal with a different (in this case lower) sampling rate. Why not? Because it has to be upsampled by the internal upsampling algorithm of Windows. Its quality is not professional (no Weiss Saracon, iZotope RX, or SoX). It’s mediocre at best, whether the ratio is an integer multiple or not. As a result, the DAC is fed a distorted(!) test signal instead of the original test signal. 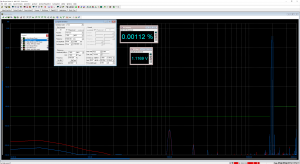 The correct and common way is to measure the device with the bit depth and sampling rate of the test signal. Audio data must be sent to the device without any modification (e.g. from the OS). This is often referred to as “bit-transparent”. 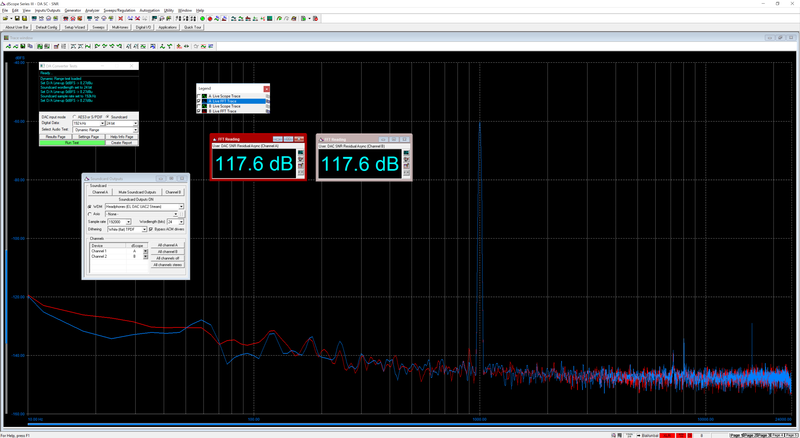 Amir, Archimago and all audio companies that measure their devices (except JDS Labs) do so this way. They use ASIO and/or WASAPI exclusive mode because both protocols are bit-transparent (in case of ASIO: unless the implementation is faulty). They do not(!) use WASAPI shared mode. 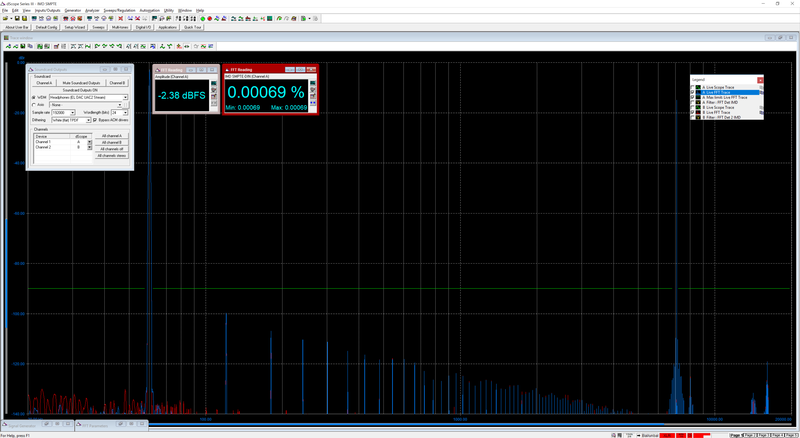 JDS Labs should measure in this way. 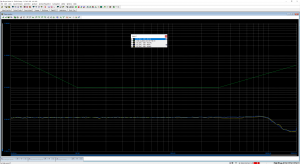 It makes no sense to measure with a distorted test signal. Ultimately, this may work to their own disadvantage as the device is likely to measure worse than it actually is. 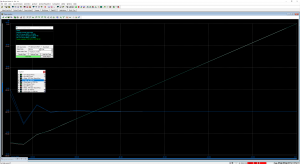 Hi, can you explain the meaning of linearity in terms of audio measurement? Does it mean target peak level vs measured peak level? What kinds of test signals are being used? Can it be affected by DC offset or very low frequency like <5Hz? Is it a valid method to judge ENOB? If no, which method will you suggest? Thank you very much! Great questions. 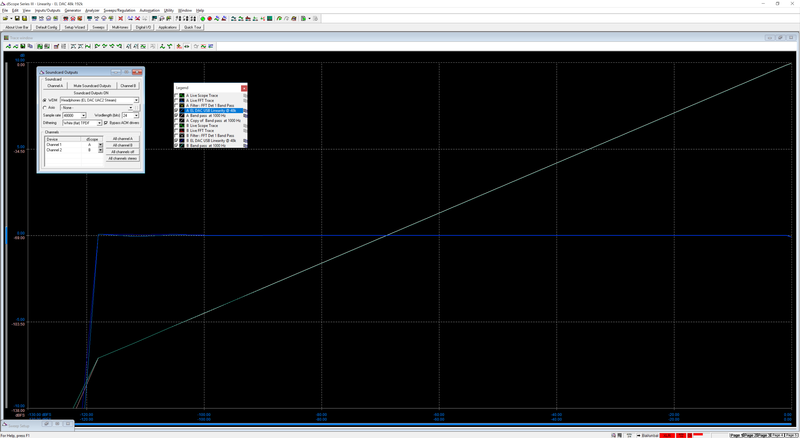 Yes, linearity is the measured output level compared to the target level. Our analyzer defaults to 1kHz sine waves. Linearity is a fine way to judge ENOB, just keep in mind that there is no consensus as to how much deviation is acceptable: is an error of +/-0.1dB okay? How about +/-1dB? 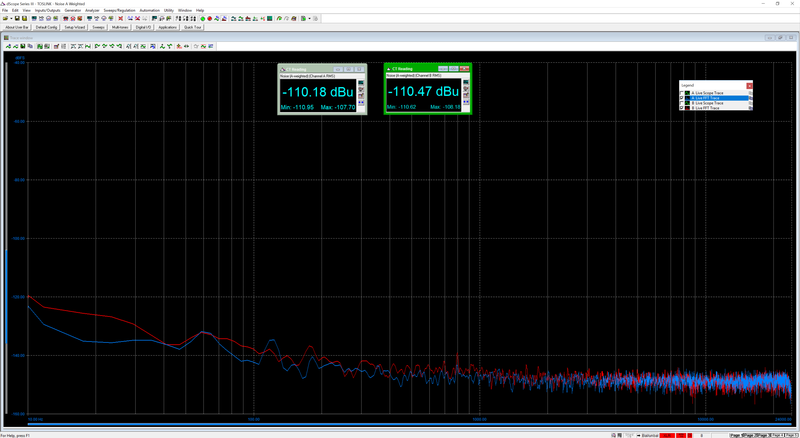 Surely +/-10dB would be a disaster. It’s well known that real world 24-bit performance is a pipe-dream. 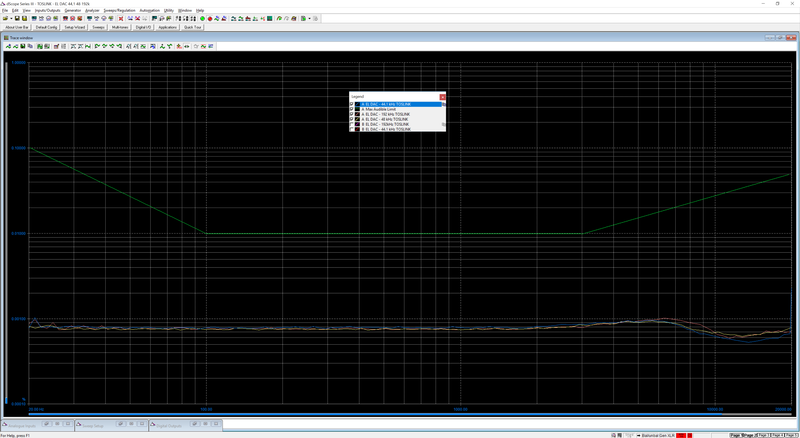 The best recordings at this time achieve ~21-bits. 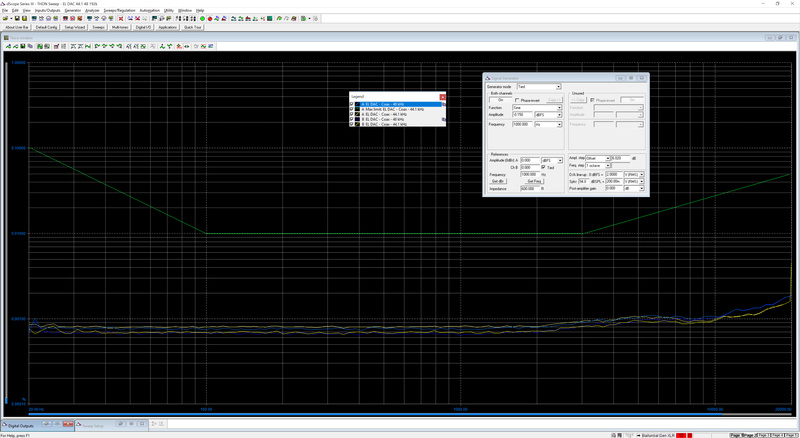 Thus, even the best ears can safely ignore linearity measurements beyond -120dB. 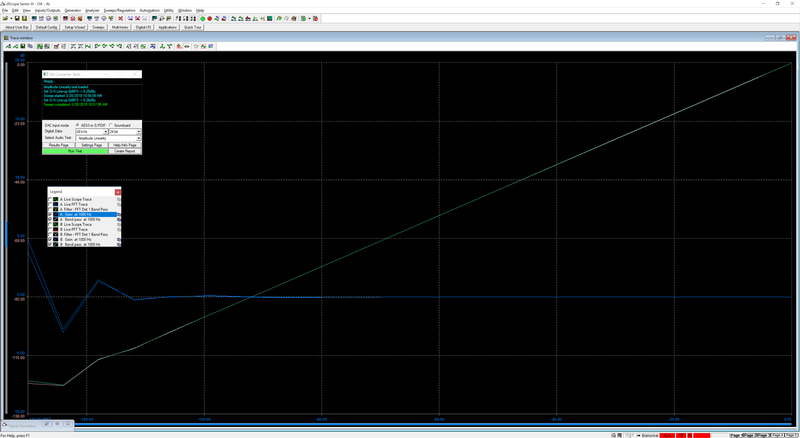 Non-linearity is easy to see. As for the meaning of linearity, a DAC with a noise floor of -95dB will produce -95dB output for a -100dB signal. I’ll leave the adjectives to talented audio writers. Yes, linearity may vary at different frequencies. 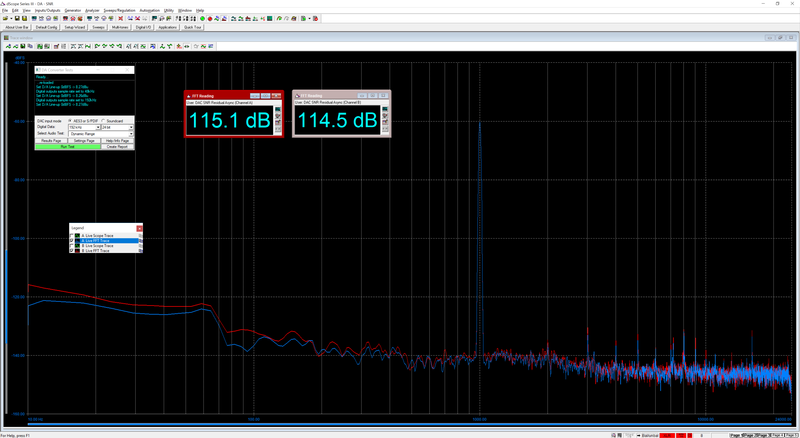 This is why it’s also relevant to conduct level sweeps, like THD+N vs Output Level (1mVRMS to 2VRMS). 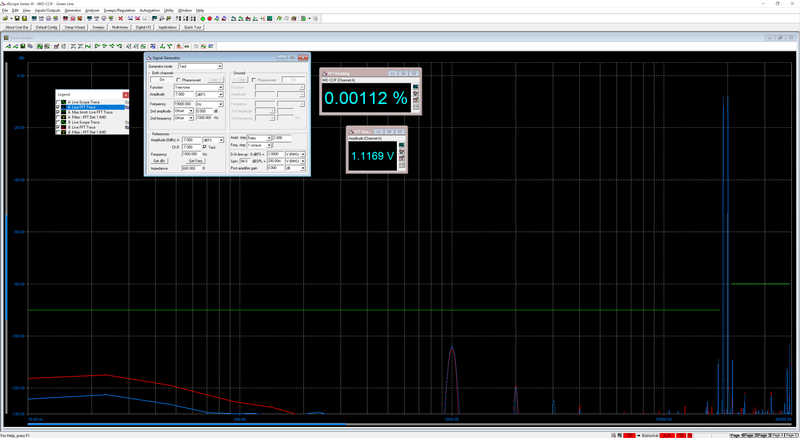 A typical THD+N vs. Frequency sweep is easy to interpret; an output level sweep is harder to subjectify. It’s important not to confuse distortion and noise. 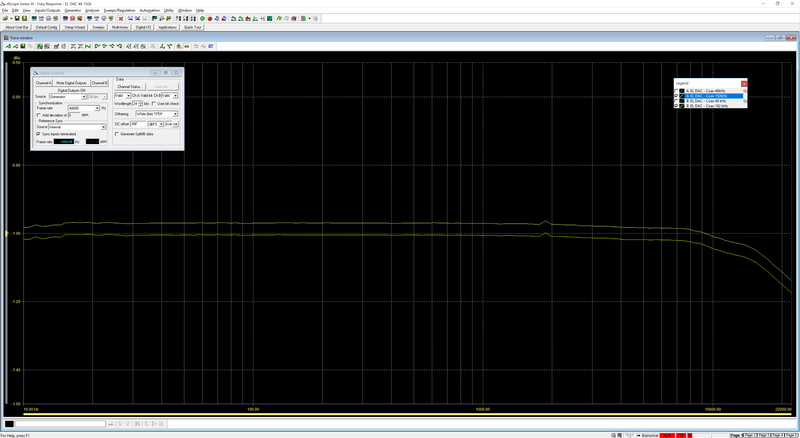 In general, a DAC which achieves low distortion + Noise versus Output Level is likely to also be quite linearity. Most likely. How low of a volume can you hear? 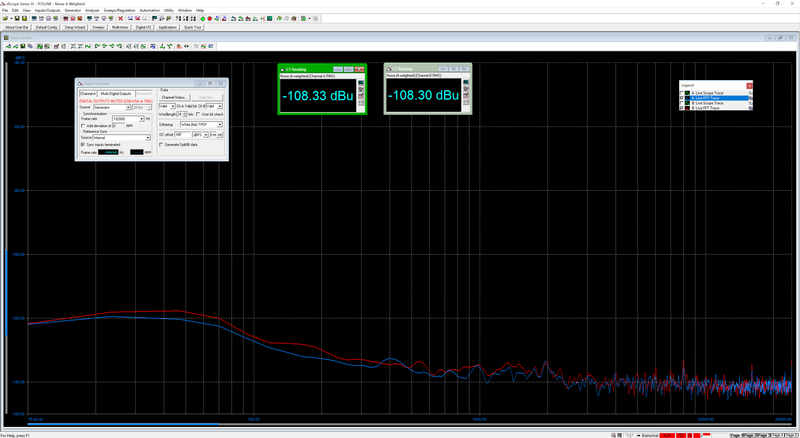 How much deviation can you detect (0.1dB, 0.5dB, 1 dB…)? 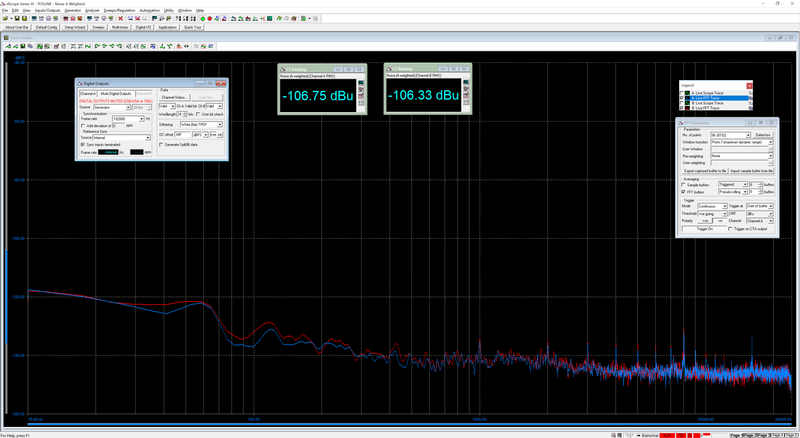 How much distortion can you detect (probably ~0.005% within your hearing range)? 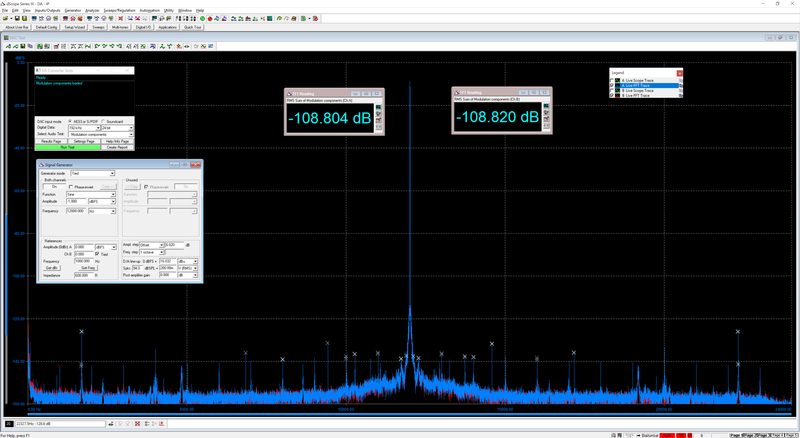 Once you know this information, you can then make better use of linearity, noise, and distortion measurements. Without knowledge of your ears, it’s all rather meaningless! In Windows Vista and later the note of OS setup is only required if WASAPI shared mode is used or any of its built-in wrappers (the legacy protocols). It has no meaning for WASAPI exclusive mode. In that case Windows sends the audio data directly to the driver, without sampling rate conversion and without bit depth conversion, the device either plays the desired sampling rate / bit depth combination or it rejects to play and returns an error instead. 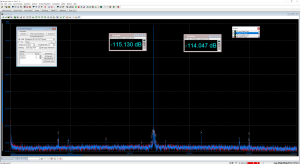 Which protocol do you use for the measurements in Windows 10? Wouldn’t it make sense to use WASAPI exclusive mode? In that case it is guaranteed that Windows does not alter the data (provided that the UAC2 implementation is faultless) and any potential upsampling would be due to the specific filter of the DAC chip. Manni – We publish test results using Windows 10’s default configuration (non-exclusive). Yes, testing in exclusive mode is also fine, but may enhance some numbers. Most customers operate in non-exclusive mode. OK, but then you measure the device with distorted test signals. This is not good and very uncommon. Please see my detailed reply to Cris above, where I explain why this is so. By the way, I’m pretty sure that there are also customers who like to listen in bit-transparent mode (using ASIO or WASAPI exclusive mode). Unfortunately, these people do not know the real quality of the device because you do not provide measurement results with original test signals. I already own ol dac optical and usb version without filter switch!!!! I admit it is very good sounding dac in comparison to sdac from mass drop and many other dac I own. But I always wonder how it compare to your el dac apart from additional coaxial input and price difference. 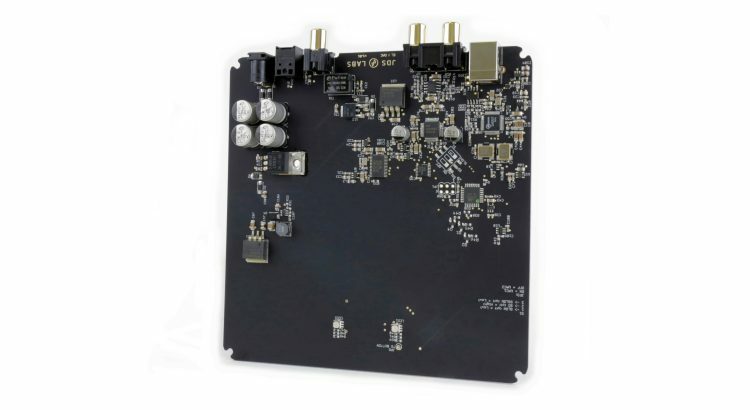 Shortly how it compare to el dac sound quality wise?